Heat oven to 350°F. Line cookie sheet with cooking parchment paper or silicone baking mat. Unwrap cookie dough. Cut 8 (1/4-inch) slices. Place on cookie sheet. Cut 12 (1/4-inch) slices; cut each with 1-inch round cutter. Place on cookie sheet. Cut remaining dough into 12 (1/4-inch) slices; cut each with 1 1/2-inch round cutter. Place on cookie sheet. Bake 7 to 11 minutes or until edges are just starting to brown, removing smaller cookies if done sooner. Cool. In medium bowl, stir together powdered sugar, butter and 2 tablespoons of the milk with whisk. Gradually stir in remaining milk until mixture is thin and smooth. Dip each cookie face down into icing and then hold up, allowing icing to drip off to form smooth finish. Dip far enough to coat sides of cookies. Let icing dry overnight. Reserve remaining icing. For each cookie cake, stack 2 large cookies on bottom, 3 (1 1/2-inch) cookies on middle, and 3 (1-inch) cookies on top. Use a dollop of reserved icing in between each to hold cookies in place. 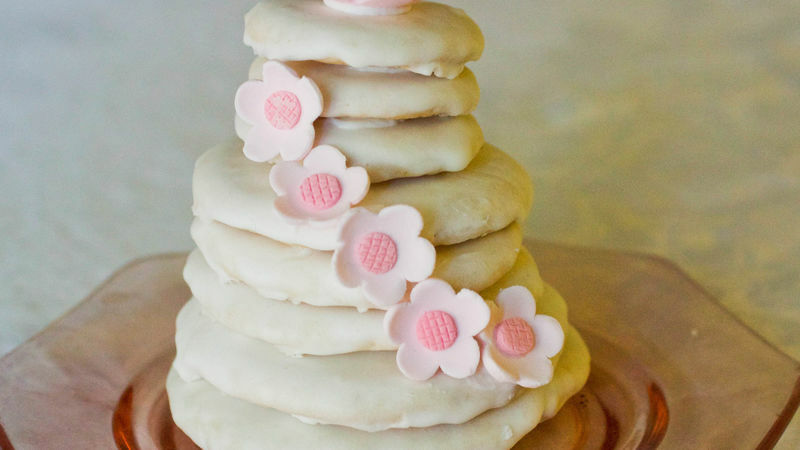 Place a dollop of icing on back of sugar flowers, and place around edge of cake. Premade sugar flowers are available at local cake decorating stores or online. Color icing with gel food color if desired.